His Holiness the XIV Dalai Lama returns to the Emory University campus Oct. 17-19, 2010, in his capacity as Presidential Distinguished Professor, the first university appointment accepted by the 1989 Nobel Peace Laureate and leader of the Tibetan people. View all program and ticket information, as well as sponsorship opportunities for the Dalai Lama's public events. Tickets for most events go on sale at 10 a.m., Friday, April 2. "The Visit 2010" marks the first return of the Dalai Lama to Emory since 2007. The appointment and his visit this year are part of the continued outgrowth of the Emory-Tibet Partnership, which was founded in 1998 to bring together the best of Western and Tibetan Buddhist intellectual traditions. "It's been three years since the Dalai Lama visited Emory for an unforgettable celebration of the Emory-Tibet Partnership, including his installation as Presidential Distinguished Professor," says Emory President James W. Wagner. "That visit was creative and spiritual, informative and transformative. When His Holiness left Atlanta then, he said, 'The professor will return.' And so he will. We know that this visit will be every bit as profound as the last." All events for "The Visit 2010" take place on the Emory campus. "Teaching to the Buddhist Community: The Practice of Compassion," 9-10:30 a.m., Sunday, Oct. 17. The special event will offer an opportunity to witness a teaching to the region's Buddhist community. "Interfaith Summit on Happiness: Understanding and Promoting Happiness in Today's Society," 1:30-3:30 p.m., Sunday, Oct. 17. The Dalai Lama will lead a public conversation on happiness with other world religious leaders and scholars, including the Most Reverend Katharine Jefferts Schori, the 26th Presiding Bishop of the Episcopal Church; Chief Rabbi Lord Jonathan Sacks of the United Hebrew Congregations of the Commonwealth; and George Washington University Professor Seyyed Hossein Nasr, a world-renowned scholar on Islam. The event is co-presented by Emory's Center for the Study of Law and Religion as the capstone of its multi-year research project "The Pursuit of Happiness." "Compassion Meditation: Mapping Current Research and Charting Future Directions," 9:30-11:30 a.m. and 1:30-3:30 p.m., Monday, Oct. 18. This all-day conference will bring leading scientists and educators into dialogue with the Dalai Lama to discuss the state of current research on empathy and compassion. "The Professor's Office Hours: Questions for the Dalai Lama from the Emory Community," 10 a.m.-noon, Tuesday, Oct. 19. This is an exclusive, moderated Q&A event with the Dalai Lama in conversation with Emory faculty, staff and students (no public tickets offered). "The Creative Journey: Artists in Conversation with the Dalai Lama about Spirituality and Creativity," 1:30-3:30 p.m., Tuesday, Oct. 19. Pulitzer Prize-winning author Alice Walker, award-winning composer Phiip Glass, and other artists from the worlds of film, popular music and more, will converse with the Dalai Lama on the symbiotic relationship between spirituality and the arts. In addition to these events, the first-ever International Conference on Tibetan Buddhism will be held Oct. 19-20 in the Emory Conference Center Hotel. 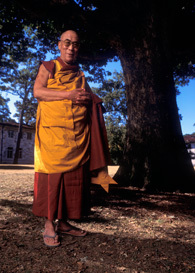 Emory is recognized as one of the premier centers of study of Tibetan philosophy and religion in the West, primarily due to the university's extraordinary relationship with Tibetan Buddhist institutes of higher learning based in India, including the Drepung Loseling Monastery and the Institute of Buddhist Dialectics in Dharamsala, the seat of the Tibetan government-in-exile. Other aspects of the Emory-Tibet Partnership include the Emory-Tibet Science Initiative, Emory's study abroad programs in Dharamsala and scholarships for Tibetan students attending Emory undergraduate and graduate schools.